Being a woman in tech isn’t easy. Women are often excluded from important conversations, decisions and opportunities. They frequently make less than their peers. And they struggle to break through the glass ceiling to move into the C-suite. Many women in tech also grapple with internal challenges. Those include trusting their own voices and overcoming perfectionism. But the problem starts even before women enter the tech workplace. Women earn more college degrees than men. And the STEM fields are attracting many women. But relatively few women choose computer science as their STEM field. In fact, the percentage of women in computer science majors is on the decline, as is female representation in technical roles at work. 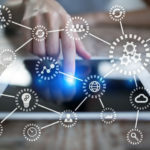 CloudNOW’s recent annual event – “Top Women Entrepreneurs in Cloud Innovation” – highlighted the upside of women in tech. It demonstrated how women in tech can and do succeed, recognizing some of the key movers and shakers on this front. And it introduced and presented diversity- and inclusion-based tech industry scholarship initiatives and recipients. This gathering at Facebook headquarters attracted a few good men and hundreds of women. I was one of them. So, what is CloudNOW? It’s a nonprofit focused on supporting women in tech and encouraging diversity and inclusion in the industry through outreach and scholarship. Chris Boehlke, one of Bospar’s principals and founders, is on the CloudNOW Board of Directors. This woman in tech brings a lot of enthusiasm and more than three decades of PR experience to the table. Bospar also donates PR services to the CloudNOW cause. At the CloudNOW event, attendees learned about the Holberton School and some of its outstanding scholarship recipients. We heard about the Shanti Bhavan Children’s Project in India. We were treated to a speech by Facebook COO and best-selling author Sheryl Sandberg. We also enjoyed presentations from various tech business leaders (most of them female) and women in the VC space. From where I sat, no one at CloudNOW better personified what financial assistance, mentorship and support can enable than Charu Sharma. She’s a serial entrepreneur and the founder and CEO of NextPlay ai, which sells an internal mentorship matching app. In accepting her CloudNOW award, Sharma told her story. And she explained what led to her leading a business that serves top-tier clients like Coca-Cola, Lyft and Splunk. Sharma wanted to pay it forward, so she created an internal mentoring program during her employment at LinkedIn. And she parlayed that and her other experiences into what is now NextPlay ai. 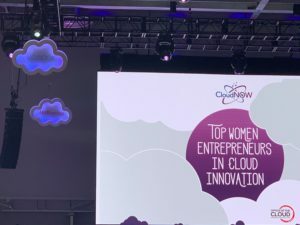 CloudNOW Founder Jocelyn Degance Graham said this year’s gathering was a watershed event both in terms of enthusiasm, the sold-out registration, and the leadership levels and technical prowess of its women honorees. That’s important for diversity and inclusion, for women and the tech industry as a whole. Studies show that diversity helps drive financial performance. Harvard Business Review research suggests that the most diverse enterprises also are the most innovative. Bospar is a true believer in the value of diversity and inclusion. You’ll see that if you take a look at the beautiful faces on the employee page of our website. And we’re here to help tech companies highlight their own amazing employees as we share their customer and innovation success stories. Being a woman in tech isn’t easy. Women are often excluded from important conversations, decisions and opportunities. They frequently make less than their peers. And they struggle to break through the glass ceiling to move into the C-suite.